A crazy stock market is perfect for covered call writers. 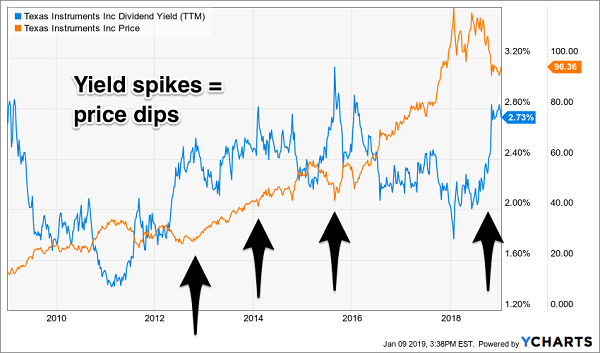 When volatility is high, so are option premiums, which means this popular income strategy should be a profitable one throughout 2019. You then sell (“write”) covered calls at a price around or above the stock’s current price for additional income. In doing so, you are agreeing to sell the stock at that price – the “strike” – in exchange for money today. Covered calls can be an effective way to increase the cash flow from the stocks you already own. Since we’re focused on cash, I prefer (as usual) to start with dividend paying investments. Calls are a way to “accelerate” a stock’s payout higher. Let’s get into a couple of real-life examples, starting with a fund that already pays 9.7%. Q: I am able to own DSL and sell covered calls. Do you have any more CEFs (closed-end funds) that are offering options on their shares? A savvy reader posed this question during our January Contrarian Income Report subscribers-only webinar. He was referring to the DoubleLine Income Solutions Fund (DSL), the vehicle run by the “Bond God” Jeffrey Gundlach himself. DSL yields an impressive 9.7% today with plenty of “dividend coverage.” Its top five holdings pay plenty, boasting coupons of 9.25%, 8.25%, 8.43%, 12.32% and 8.25% respectively! Granted, DSL’s bond holdings are obscure but that’s why investors who own DSL essentially hire “Bond God” Jeffrey Gundlach to search the globe for us for big fixed income payments. He’s the top bond manager on the planet and often gets the first phone call on new juicy deals. You and I can’t buy these bonds as individual investors, but the Bond God can buy them for us. Plus, his management fee is essentially “comped” today thanks to the fund’s 5% discount to its NAV (net asset value). This means we’re buying DSL’s bonds for just 95 cents on the dollar, so we can toss a couple of pennies back to the Bond God for his brilliance, no problem. Back to covered calls and our reader who is “accelerating” DSL’s yield from 9.7% into double-digit territory. It’s a smart strategy, but it’s also limited by the fund’s option availabilities. This means we can receive an extra $0.20 per share today if we sell calls that “strike” at $20 for DSL. In other words, if DSL pops above $20 between now and August 16 we have to sell it for “just” $20 (and not $21 or $22 or whatever). But since our call doesn’t expire for another 210 days, we can’t quite run it twice a year. So we’re only looking at an extra 2% yield annually. While that’s better than nothing, and 11.7% annually is nothing to sneeze at, we can do better. My suggestion? We should consider high yield stocks – not CEFs – with more trading volume. This usually means we have more call options to choose from, and more income to collect. Q: Can I Write Covered Calls on OHI? Now we’re talking. Omega Healthcare Investors (OHI) yields 6.9% today, and its dividend is well covered by the rents of its tenants (who operate skilled nursing facilities). OHI may not pay what DSL does, but it offers more options, more often. Here’s what I mean. If OHI closes above $39.00 per share on March 15, then we’ll keep our $0.53 in call premiums (or $53 per contract because they come in lots of 100 shares). We’ll also sell our shares at $39, which means we’ll pocket an additional $0.94 per share (or $94 per contract) in capital gains. If OHI closes below $39 that day, we’ll still own our shares. We’ll still have made our $53 in cash per contract from this trade. And we can then write a new set of calls. Worst case, we’ll accelerate OHI’s dividend from 6.9% to 16.0% yearly if we continue to sell calls on our shares. Best case, we’ll keep the call income and the capital gains and the first quarter’s dividend for a neat 32% annualized return! Remember, a call option is a contract that gives its buyer the right to purchase a stock from the seller (here, that’s us) for a certain price within a certain period of time. For that right, the buyer pays the seller a sum upfront, called a premium. Option traders usually buy calls (instead of selling them like us) hoping they can multiply their money in a short period of time. Rather than buy a stock and hope for a 10% gain in a year or so, they buy call options aiming for a 100% gain in a month. Of course there’s a catch – otherwise option traders would be the richest people in the world! And that caveat is time. When you buy a call option, not only do you need the share price to move higher for you to make money – but you also need it to happen within a relatively short timeframe. The clock is ticking. Loudly. With each day that passes, options decay in value. That’s bad for buyers, but great for sellers like us – those who collected the premium up front. With each passing day, we grow richer. We don’t have to worry about the clock. In fact, it’s our friend. 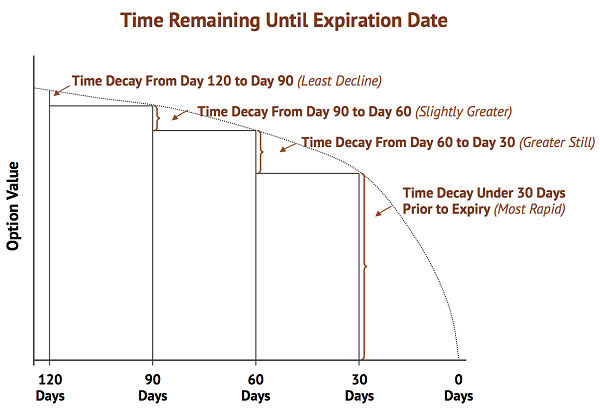 The closer we can find options to their expirations date, the better we can exploit this “decay” and pocket these accelerated dividends. And my favorite way to do this involves selling puts on stocks we’d love to own at a discount to their current prices. It’s the same mechanics as writing a covered call, but even easier – usually we can collect the income without ever buying the shares outright! This approach is perfect when applied to dividend growth stocks. Why? 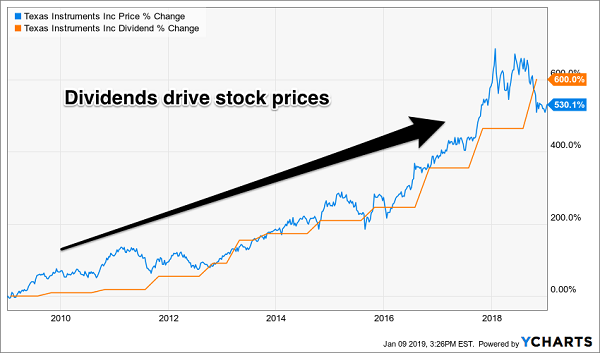 Dividends are magnets that pull their share prices along with them. If you’re looking for the stock market’s tail that wags the dog, pay attention to the payouts attached to a given share price. Thanks to the firm’s recent 24% dividend hike, the stock will pay 3.3% over the next 12 months (more than its 2.7% trailing yield). But we can juice this payout to 35% annually simply by selling options that give us an additional margin of safety versus buying the stock outright. Editor’s Note: Our Options Income Alert historical trades and current open trades are available to paid subscribers, so I’ve got to stop Brett there. 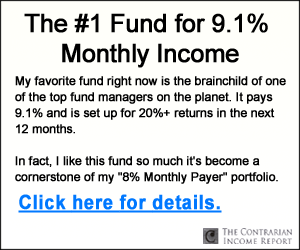 But you can take advantage of our current 60-day risk-free trial by clicking here and scrolling down to the bottom of the page. If you’re interested in following Brett’s trades and “options for income” strategy, please don’t delay. We only open up this service a few times each year. This window will be shutting down shortly, and I’m not sure when my publisher will re-open the service. We cap our subscriber count so that everyone has the opportunity to execute the trades that Brett recommends. He’ll be emailing out our next income alert tomorrow. Don’t miss it! 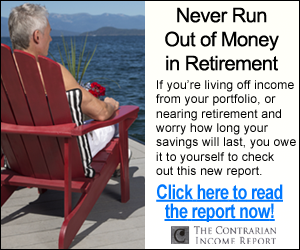 Click here to be added to our Options Income Alert email list now.